July 17, 2014. Traveling from Zimbabwe overnight on Friday night, we were suppose to get to Polokwane, South Africa Saturday morning at 7:20am. TIA – This is Africa (as one of the locals taught us) was very clear during that bus ride. As we were entering our 4th hour at the Beit Bridge border, I could do nothing but laugh at the fact that we had been in and out of the bus 3 times, they went through our bag twice, and at the time we were suppose to arrive in the Limpopo province of South Africa, we were still in line at the border. Finally, after hitting the road again around 9am, I started to realize why patience is a virtue. The 17 hours traveling made me appreciate what was to come next way more. A Red Cross representative (our partner in Mokopane) picked us up from Polokwane and drove us the 50km to Mokopane. Right away, we knew it was going to be something special. 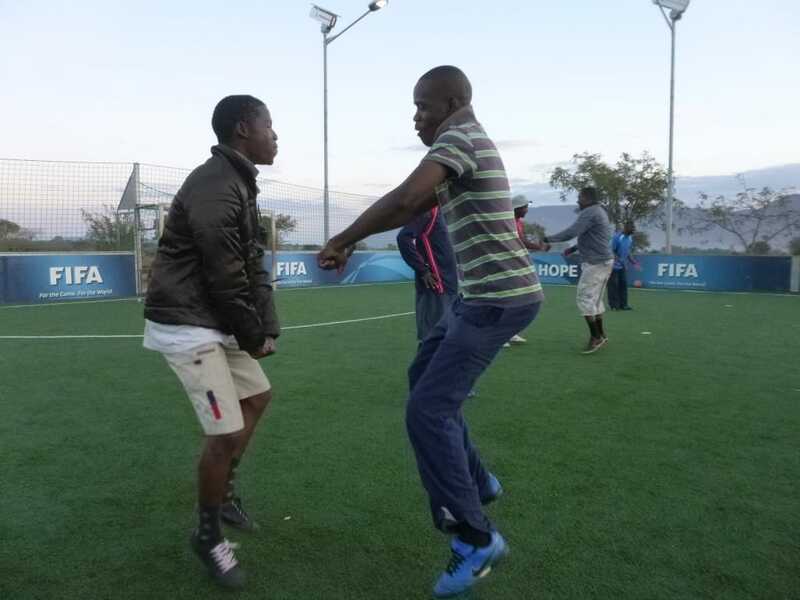 We were staying at the hotel with all the participants, a shuttle was driving us to and from the facility (so “Africa time” was not a factor), we were getting fed three times a day, the sessions were on a turf field at the FIFA For Hope Center Mogalakwena, and we had more than 40 participants. What else could you ask for? Once we got to the hotel, I opened the door and saw three double beds, a TV, air conditioning, a big bath, a shower (with hot water) a tea/coffee machine (which is comfort food for me) and there even was wi-fi available! It is crazy the difference that two weeks can make (see Connection Not Found: Please Try Again blog). We, as Coaches Across Continents, welcome all circumstances and enjoy both also! After meeting with George Mamabolo, the South Africa Red Cross manager of the Limpopo Province, it was clear why the program was so well organized. The Department of Sports, Arts and Culture was sponsoring the whole program. 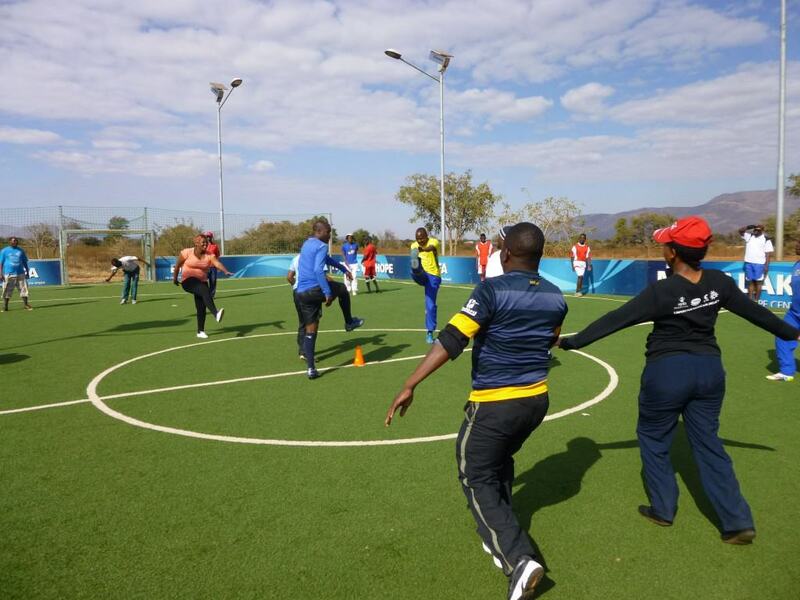 That way, it was possible for coaches from all over the Limpopo province to come and be a part of the program. Finally, Monday morning came, and it was time to start with the program. Over the next two weeks, we played over 50 games from our curriculum, had two sessions of coach backs (where the coaches coach either our games or new games), had two tournaments with the community, our compulsory child’s rights discussion, a discussion on characteristics of a good coach, but most importantly, had tons of fun and smiles. During the first week, we focused on identity building and HIV/AIDS, as requested by the coaches. The coaches were all really eager to learn, and it made the sessions very interesting and very impactful. During the second week, we focused on child’s rights, drug and alcohol abuse and on environmental education. During all the games, it was awesome to see them recognize what needed to be done and how they could work together as a community to improve. With all the games we played, I think my personal favorite was 95% football (invisible soccer).The teams came up with different strategies that made the game really interesting. One of the teams even called their players by different names so the other team would not know who they are passing the ball to. The game was filled with smiles, conflicts, solutions and laughs; making it a really successful game. The two weeks in South Africa were awesome, as we had a good program, but so much more. It helped me learn a lot about the impact we coaches can have in coaching for social impact and it helped me learn about myself a lot, as I was sometimes push to surpass my limits. Not to forget about the different words I learned, my favorites being Yebo (yes) and Laduma (goal). My dance move repertoire was also expanded, and my coordination improved greatly, thanks to Circle of Friends (Sedikwe Sa Bagwera) dancing exercises. After having a nice celebration last night with the participants, it is now time for me to head home. My adventure with CAC has been really enriching and I could not have asked for a better way to spend my summer – beside maybe being in Brazil to see Germany in the Final. One thing for sure, no where would I have learned as much! Now, time for 40 hours of traveling!